← Baltimore Screening Pass-palooza: “Happy Death Day 2U”! Story: When we last left our gang of LEGO pals, they were faced with an invasion by DUPLO monsters. But several years have gone by since then, and let’s just say that things aren’t as awesome as they used to be, because Emmet and the gang have to try to survive while battling the toughest foe they’ve encountered yet. Welcome to…Apocalypseburg? 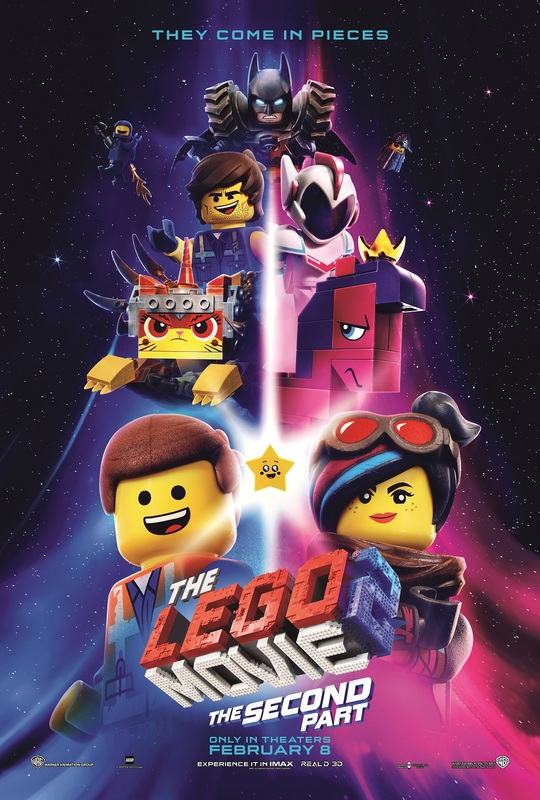 Remake, Sequel, Based-On, or Original: Sequel to The LEGO Movie, based on the LEGO brand toys. Gotta say: The LEGO Movie was indeed awesome. But I kinda dug The LEGO Batman Movie a bit more. Maybe it was that super-dry humor, or maybe I’m just a Batman gal at heart. Who knows? (I sure don’t.) But LEGO 2 digs into that same trove of whipsmart deadpan and show-don’t-tell gags, with plenty of heart and the obvious message. #FamilyFriendlyFilm By coming up with new themes for the usual action-packed “save the day” storyline, LEGO 2 shines up these little bricks and makes ’em just as entertaining as the first – and second – go-round. As you may have figured out from the ending of the original film, this LEGO universe is housed in the basement of young human protagonist Finn. But there is, unseen by Emmet and his friends, an underworld, a place that is just as real, but super brightly lit…a side built by Finn’s sister Bianca. (shout out to my fellow Darkside fans) While this may seem like a spoiler for people who don’t like trying to suss things out (and I wish I was more like you sometimes), it’s how this film tackles that conflict – and how it plays out in LEGO-land – that makes this story so much fun. A big part of the success of LEGO 2 are the voice performers. I love that Jason Momoa voices Aquaman. I love that Margot Robbie voices Harley Quinn. And as a die-hard Tiffany Haddish fan, I love that she voices…oh wait. No. Not gonna tell you that. It’d ruin the chuckle (or if you’re more like me, the guffaw) when you find out. Sure you can check IMDb, but don’t. Don’t hamstring yourself. Let it unfold. Breathe. Of course Chris Pratt, Elizabeth Banks and Will Arnett are just as awesome here as they were before, voicing Emmet, Wyldstyle/Lucy and Batman. Writers Phil Lord and Christopher Miller return to LEGO-land, giving the actors plenty to work with, and crafting a script that smoothly blends live-action and animation. There was a bit of cross-pollination of worlds here, which was okay(ish) but came at me like a record scratch each time it happened (don’t worry, it doesn’t happen often). All in all though, director Mike Mitchell brings it all together nicely. Yes, the themes of cooperation and not judging a book by its cover are a bit heavy handed. But this isn’t an art film, it’s a movie for kids and the grownups that love them/never stopped believin’. Plus, there’s ABSOLUTELY THE BEST earworm ever created in among the fun Mark Mothersbaugh (Thor: Ragnarok) score. Not to mention that killer soundtrack. Kudos to the art department and animators for making things “realistic” in this film; as the characters have been dealing with invasions, their bricks are scratched, paint has chipped, and edges are worn. It’s a small thing, but it shows the work that went into every detail. You don’t have to spring for 3D or IMAX for this film, as things are glorious in regular multiplex vision…but if you’re gonna pick one, I’d say go with IMAX. Get that glitter everywhere, y’all. Don’t leave before getting through at least half the end credits. The first section of the credits are beautifully done in LEGO pieces, with “masking tape” used to mention cast and crew. So, wanna have a great time with lots of glitter, desolation, and Emo Batman? You know what to do. #Protip: Pay attention to new character Rext Dangervest’s self-description. It may remind you of…I’ve said too much. This entry was posted in General Mayhem and tagged Family Friendly Films, LEGO, Movie Reviews, Sequels. Bookmark the permalink.